It’s not often that I eat ice cream that I think isn’t any good. Even second-rate ice cream is usually pretty decent. Breyers Vanilla Fudge Twirl ice cream is probably the worst ice cream I’ve ever eaten. Maybe I’ve had some “ice milk” or “frozen dairy desert” that tasted worse, but I’m not even sure about that. Breyers Vanilla Fudge Twirl ice cream has two strikes against it right from the get-go: the vanilla flavor is virtually non-existent and the texture is not what you expect from a quality ice cream. The third strike comes from the alleged “fudge twirl.” I didn’t taste or see any actual fudge in the ice cream. There were some thin streaks of cheap-tasting chocolate throughout the ice cream, but it certainly didn’t qualify as fudge. 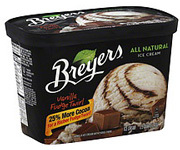 I’ve had some other Breyers products that were pretty good. I’m not sure how they got so far off track on this product, but I recommend that you stay far away from it.